Ah, now I understand. Thanks. That routine is useless for my current purpose, but it should be good for the Hijacked Generation Ship (tm) in my Interstellar Tweaks, because ships launched from that do sometimes end up in the entrails of their mothership . .
Also ('also' because: see my post above) I have the following problem. Oolite development version 1.87.0.7085-180729-89d301b (x86-64 test release) under Windows 6.3.9600.19155 64-bit. Montana: ah, I see from that link that the Q-bomb has indeed been banned! Ha! var qbomb = ship.spawnOne("extraThargoids_qmine"); 	 // inbuilt qmine AI is buggy. and the AI provided by Montana. Thanks! Glad to help, I forgot to mention that you need to create your own Q-Weapon in order to make it work but you figured it out already. While doing some minor tweaking to the CombatMFD.oxz found a reference to the combatSLBar which allows your HUD to show a gauge that displays the service level (when the next maintenance overhaul is needed) for your ship. Got my head around how to make the actual gauge and put it into my Coluber HUD (position, size, colors, etc.) but cannot figure out how to get the hud.plist and the script.js to recognize one another and talk back and forth to actually get the gauge working and updating itself. Always wanted a status update on my ship's service level. Found it odd that Maintenance Overhauls come as a surprise when you dock given the technical sophistication of the ships in the game. Went through the function setCustomHUDDial(key : String, value : Value) for the script.js and the drawCustomBar: - a number between 0 and 1 for the hud.plist but any combination of things tried did not work. In the script.js is the function setCustomHUDDial(key : String, value : Value) a this., a var., an if., or just a function? The (key : String, value : Value) part made some sense with the key being a number between 0 and 1 and the string referencing combatSLBar but what are the entries for (..., value : Value)? Hope that makes some sense. It's been a while. Thank you spara. What you posted does make sense to me. Adapting it to my needs will be another story. Fingers crossed that it will work out. Perhaps Norby is the person to contact as he created the combatmfd.oxz and lent a hand to the Coluber HUD as well. PM on the way. setCustomHUDDial. Don't know the exact pieces of your puzzle, but if that this.$setData... is a function that updates the gauge, check that it actually gets executed in a timer or in an event handler. 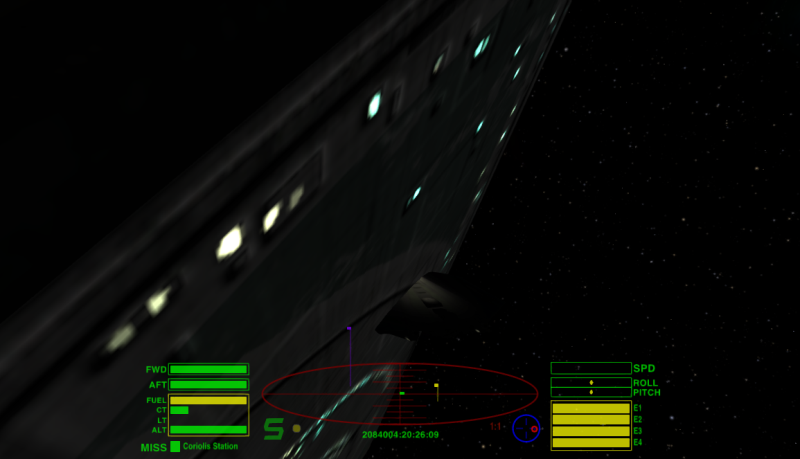 CombatMFD contain a 0.25s timer which update the value of combatSLBar and Large HUD in HUDSelector display it below the scanner, labeled as Hull. The scripting details are starting to make sense to me but before the time is spent putting them into practice there is a bit of confusion on my part as to exactly which player ship status the Combat Service Level Bar is measuring. Service Level Bar made me think (as stated in my original post on this) that the maintenance level of the player's ship was being measured. That is the number of, and/or damage from, Witchspace Jumps that the player's ship had taken until the next Maintenance Overhaul was needed. Looking through the Wiki entries you linked to in your post, and with the "Hull" label on the Combat Service Level Bar in the Wiki's pictures, it appears that the incoming battle damage to the hull, from whatever source, is being measured. Not 100% sure which one of these two is correct. A very useful gauge to have in either case. Although, truth be told, option one was what was hoped for. Thank you both, once again, for you help with this. It is deeply appreciated. My brain hurts much less now. May actually get some sleep tonight without variables dancing on my pillow. Not 100% sure which one of these two is correct. You're understanding of Service Level is correct in what it does from the game's perspective. However, that internal concept doesn't easily translate into a game-world concept. What Norby has done is given it a game-world frame of reference. It is not, in any way, related to the state of the hull, but the appearance of the hull would be a readily observable state someone in the game would be able to see. So Norby has drawn a line between the two. It's worth noting that some properties of ships are not inherently designed to be displayed to the player, given the function they perform in the game (Service Level, AI states for NPC's, even roles sand role weights). They're used to maintain game state, but it doessn't always make sense to display them as-is.